Murry Garde (Interpreter), John Mawurndjul, Nici Cumpston and Silke Hohmann (Moderator), f.l.t.r. In the context of our current exhibition Indigenous Australia: Masterworks from the National Gallery of Australia an artist talk with Nici Cumpston and John Mawurndjul will take place on Monday, 5 March at 7 pm. 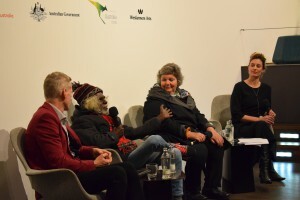 Topics, motifs and techniques of contemporary Australian Aboriginal artists will be discussed with moderator Silke Hohmann (Monopol-magazine). Admission to the talk is free of charge. Until 7 pm the exhibition can be visited (Admission: regular 8€ / reduced 4€). The me Café will be open until the end of the talk. Until 17 March, some works by Nici Cumpston are also on show at Michael Reid Gallery, Berlin in the exhibition “Calling In“.